In an effort to preserve as much history of the Lytle Police Department as possible I have compiled what information I have on shoulder patches and badges used in during the past forty years. When I moved to Lytle in 1985 the department uniform consisted of a baby blue shirt and navy slacks with a baby blue stripe down the leg. The shoulder patch was a "stock" eagle that was very common with smaller departments all across the country. I have no way of knowing for sure but this could have been the first patch design ever used. 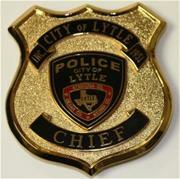 This was the first badge that I saw being worn by the Lytle Police Department in the early 1980's. It was discontinued in 1990 when Bill Ricks became Chief of Police. Bill Ricks was hired as the Chief of Police to replace long time Chief Lee Thorman. Chief Ricks had been the Chief of Police in Jourdanton for ten years prior to coming to Lytle P.D. I was a 20 year old kid who was trying to get into the police academy. Chief Ricks and I became friends and he asked me to come up with a few sample designs. He wanted a six point star in the design since the new badges he was ordering included that on them. This patch was one of my designs. This is the badge style the Bill Ricks implemented when he became Chief of Police. When I became the Chief of Police in October of 1999 the department had only a handful of mix and match badges, three different styles to be exact. I selected a seven pointed star badge and ordered enough for all the staff and a few extras. I had a full time staff of five and four reserves. We needed to order patches so I decided to change the design a bit. The style was only in use for a year or so. There was a problem with the quality and they weren't holding up well. My first patch as a chief was a failure. In 2003 I designed a new patch, I felt so bad about the prior purchase that I bought 300 of this design and paid for them out of my pocket. We incorporated the three counties on this design. It is still our primary shoulder emblem, we have had it produced in a subdued version as well. I wanted to change badges styles and get a truly custom badge, I selected Symbol Arts out of Ogden, Utah for the project. I paid for the die set up and purchased a badge for each officer out of my own pocket. They were presented to each current officer as a show of my appreciation for their dedication to our department. With the reorganization and creation of a couple new ranks in July of 2011 I needed to order several new badges. I opted to keep the same basic design but replaced the state shape with a center seal depicting our patch. The following list is the City Marshals / Police Chiefs. Information was researched by City Secretary Josie Campa for the 50th Anniversary of incorporation of the City.